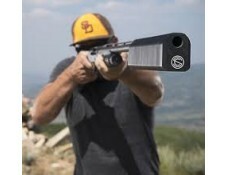 The SilencerCo Salvo 12 is the first and only commercially-viable shotgun suppressor on earth. It represents an incredible advance in engineering and technology, and carries with it the same quality and service as SilencerCo’s other products. Every year, millions of sportsmen and women venture into the fields to hunt. While rifle and handgun suppressors continue to increase in popularity, shotgun owners have been without a real solution for ear protection. Some choose hearing preservation in the form of earmuffs or plugs for relief in controlled environments, but spurn their use in the field or in a home protection scenario, where the ability to detect other sounds is critical. The Salvo 12 is modular in nature — the shooter can add or remove sections to balance their sound suppression, weight and length needs. At its full length of 12 inches, it brings sound down to 137 dB at the muzzle — well below the 140 dB hearing-safe level set by OSHA. The Salvo 12 is just one more example of the type of innovation that has garnered a fiercely loyal customer base for SilencerCo.